Pros: Heavy base makes foot pedal operation easy.No assembly required.Good sealing lid for a less than ten dollar can. Use w/smelly garbage.Besides having an optional lock on the lid when it's closed, you can fully open the lid and it seems to lock w/o holding the foot pedal down. Makes it easy to switch bags.Cons:$150 stainless outside versions come with a lift out bucket. This does not.I'm using Glad 13 gal white kitchen garbage bags w/ the red pull tab and they work great. Stuff 'em around the hinge and it goes over the rest of the lip.I'm spoiled with twice a week garbage pick up so I rarely stuff my inside garbage cans. If you are a stuffer or use your foot to push garbage down and make more room don't get this can. You need the expensive one with the lift out bucket. This can has exposed potentially sharp ribs and the lift hardware is exposed in the interior. You'll tear the bag lifting it out or jam the lifting mechanisim. Then you'll have to clean the can too! 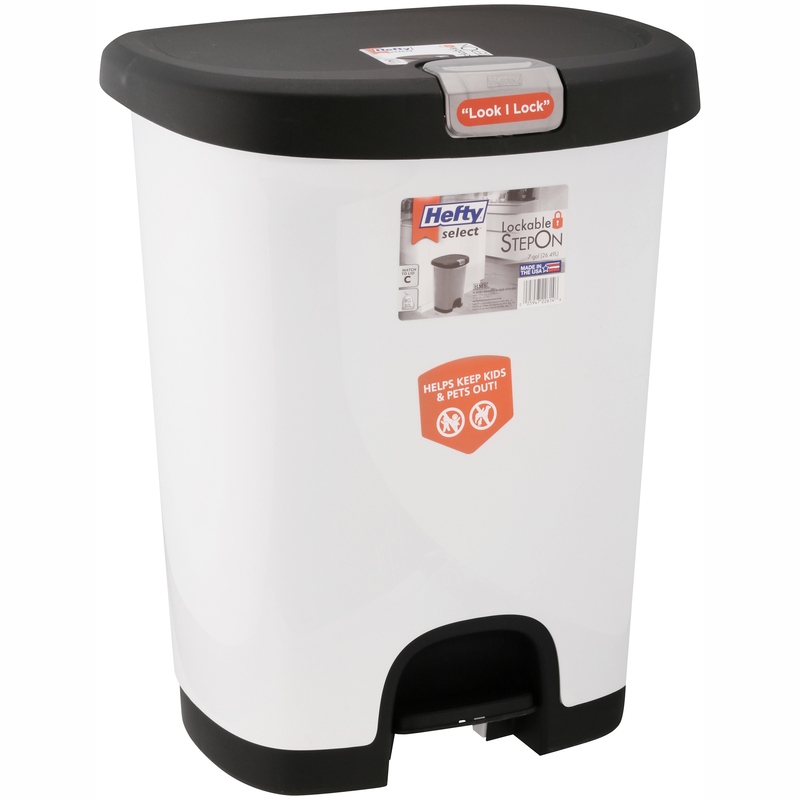 Home territory searches the web to find the best prices and availability on Trash Cans and related products foir your home like Hefty 7-Gal Textured Step-On Trash Can with Lid Lock and Bottom Cap, Multiple Colors. For this page, related items include products we find that match the following keywords: "Trash Can|Garbage Can|Trash Bin" at our vendor partner Walmart - Click More Info / Buy Now to check for price rollbacks!. Hefty 7-Gal Textured Step-On Trash Can with Lid Lock and Bottom Cap, Multiple Colors is one of 49 Trash Cans and related products available for sale through HomeTerritory.com, If you have any questions on this product, please give us a call at 734-971-1210 during the hours of 9am - 5pm EST for assistance. Thank you for shopping at Home Territory, the home furnishings superstore!